I hope that you had a nice October. It went by fast and I am still getting used to November. We have celebrated My youngest daughter with a breakfast party, I will try to get it in a post. My birthday was yesterday and I met up with my husband in the city for dinner at the Four Season Hotel, Garden restaurant, highly recommended. One thing that I learned now is that it is Striped Bass season at the moment, I am not sure for how long but it seems to be a short period. My son had tried to convince me to drive him and his friend to fish on a Party boat. By coincidence a friend mentioned that she had a trip planned and would not be able to go. This was actioned out on a Kellogs club fundraising event. It is a club in Morristown that are preserving a house, they have a pool and many social events, we have considered joining and have many friends in the club. Me and my son, middle daughter and my sons friend ended up going Tuesday. I was hesitant, but it was much more fun than what I expected. We were lucky with the weather, warm and sunny! You never know in NJ, it can be freezing this time of the year. The captain David was driving for hours to find the right spot and we could see NYC, we started out from Point Pleasant further south. The boat chartered was one of the Kellog Clubs members highschool friend. It is called Queen Mary Party Fishing Boat. 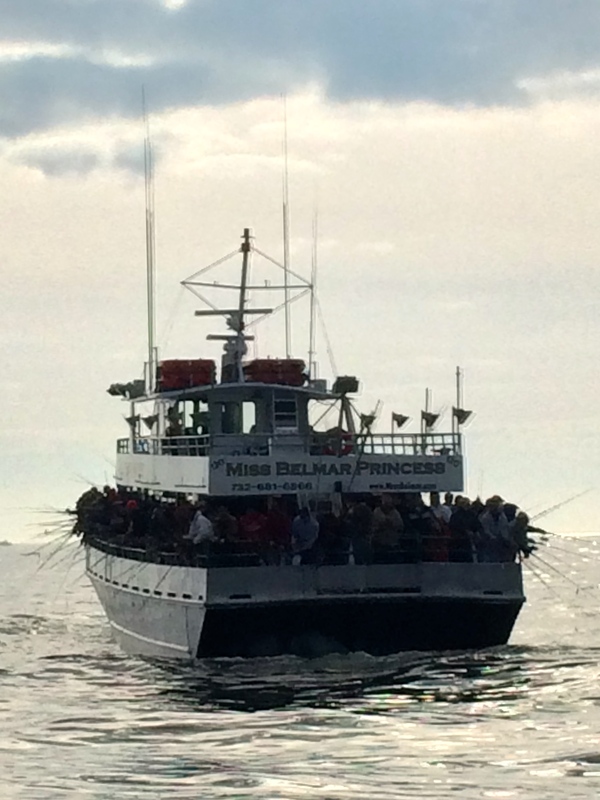 We spotted some other boats on the ocean, and I think that you should avoid Miss Belmar Princess, incredible crowded. We were about 25 on our boat! My son caught a Bluefish, he is getting help from the crew to get it out of the water. I borrowed my husband bright yellow pants, it gets easily cold and wet. 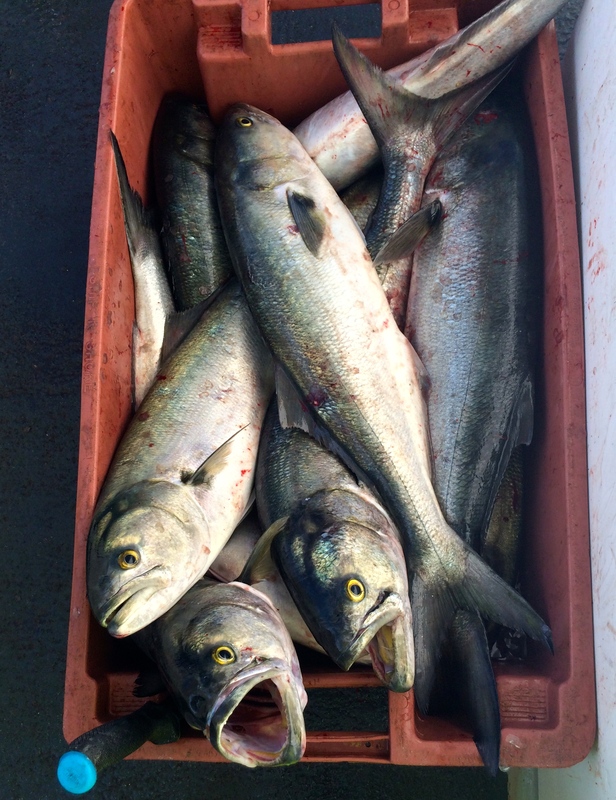 I was happy to have them, the others commented that I looked like I was part of the crew… It was really my first time deep sea fishing. The captain and my sons friend are showing the second largest catch of Striped Bass that day. Thank you f or reading and have a wonderful day!